Do you have a beloved quilt that’s needing a little TLC? 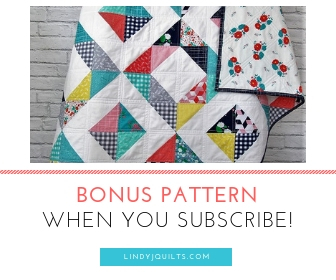 Well if you have a little time and some extra scrap fabric, then you can most likely make the necessary repairs to your quilt and give it a little life. Today’s post is all about how to repair a quilt with patches and hand-stitching. We had a local client enlist our help in repairing a cherished quilt her mother made over 30 years ago. We don’t often hand-stitch or work with older quilts, but after seeing what was needed to give this quilt a little love, we took on the challenge. This vintage quilt consisted of a nine-patch variation containing 3 1/2” finished squares and 3 ½” flying geese triangle squares. There were 10 blocks were the fabric was fraying, torn, or completely missing. After assessing the overall style of the quilt, we decided on using vintage Denyse Schmidt material for our patches. We felt it was important to try to make the fabric blend in with the overall mid-century vibe so that the new fabric wouldn’t stand out. First, we needed card stock that would be heavy enough to be a template – we didn’t want to use paper since we’d be ironing it quite a bit. I found the perfect weight card stock in my stash of stationary. We created finished sized templates that were slightly larger than the original unit. In this case, the units measured 3 ½” x 3 ½”, so we added a 1/8” to all sides for the squares and triangles. Next we pressed in the rough edges by using the template as our guide. We used a lot of heat and steam in order to create nice and neat flat finished patches. The squares were pretty simple. The triangles took some folding and tucking. Hand-Stitch Patches Directly Over Missing Unit. Since we were dealing with missing units, we opted to place the patch directly over the damaged area, pin it in place, and hand-stitch it by using slip stitches. There are other ways to sew your patch on! You could machine sew a 1/8” of an inch from the edge or use a zig-zag stitch to give it added flair. Our client wanted to keep the stitching subtle and when you look at the quilt from afar, you can barely see the stitching. Since there were 10 blocks with at least 9 units that needed repairs, this project involved quite a bit of cutting, pressing, and hand-sewing! We must have sewn on 120 units! But it was all worth it in the end! The quilt turned out better than expected. The quilt even feels stronger and we know our client will get many more years of memories with her mother’s quilt. Hand sewing has been a nice break from our regular sewing, but we have to get back to our custom orders and upcoming new patterns!